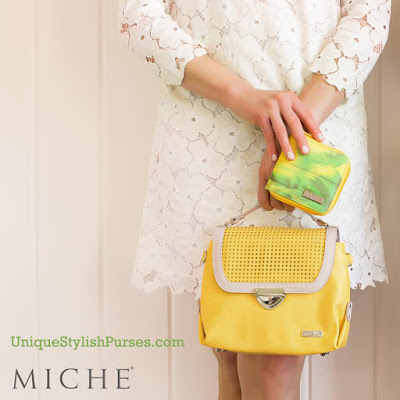 Unique Stylish Purses | Miche Bags: What Miche Shell or Hip Bag shows your summer style best? What Miche Shell or Hip Bag shows your summer style best? Smooth faux leather in pineapple yellow can’t help but make you happy and brightens any outfit. The Cori Hip Bag also features cream accents and a chic perforated flap with push-lock closure. Open interior is lined with fabric with an exquisite multi-color abstract floral print. Cori comes with built-in top handle and detachable matching long strap. Bag is completely self-contained—it is not interchangeable like our traditional bags. Dimensions: 9 ½” long x 7”tall, with a 2 ½” gusset. Top handle dimensions: 8 ¾” x ½”, with a 1 ¾” drop. Strap dimensions: length adjusts to 58” x ½” wide, with a 26 ½” handle drop. This little piece of square perfection is ideal when you don’t want to carry much. It slips perfectly into the front pocket of your jeans, a hip bag and even a clutch. A palm tree print in shades of yellow, orange, green and blue was inspired by tropical beaches. Pineapple faux leather interior and yellow wrap-around zipper pump up the fun. Interior zippered pocket for folded bills or change and an ID slot lined with cream fabric plus two additional card slots. Wrap-around zipper closure. Dimensions: 4” x 4”. Silver hardware.